Kerry Hammond has been chatting with Carolyn Dyer, author of Rediscovering Nancy Drew. She's here to tell us some things she learned. I find that you meet people in strange, but interesting ways. I recently had a house guest named Carolyn Stewart Dyer. I found out that Carolyn was not only a Nancy Drew expert, but had written a book on the subject. Since I grew up reading Nancy Drew mysteries, I was excited to meet her, even more so when she graciously agreed to sit with me, over a glass of wine of course, and discuss her book and the research she conducted. I found out quite a few fascinating facts, not only about Nancy Drew, but the phenomena surrounding the character. First, a little bit about the super cool author. 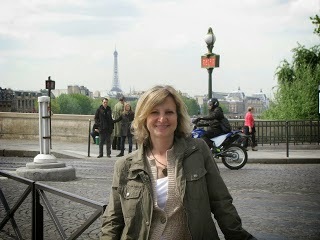 Carolyn Dyer is an associate professor in the School of Journalism and Mass Communication at the University of Iowa. And now let me tell you about another School of Journalism alum, Mildred Augustine Benson. If you’re a Nancy Drew fan, you know exactly who that is. In 1927, Mildred was the first person to earn a Master’s Degree in journalism at the University of Iowa. She wrote children’ stories and published her first at age 12. Ok, for those who are not in the know, Mildred is the first person who wrote under the pseudonym Carolyn Keene, and she wrote more than 20 of the original Nancy Drew books that were published. Now for some fun facts. Nancy Drew has been translated into several languages, but each country has its own name for the young sleuth. She is known as Kitty in Sweden, Alice in France, and Paula in Finland. Many of the people that Carolyn spoke to remember trading books with friends and using their birthday money to buy new books. Many adults even attributed their professions and interests to having read Nancy Drew. Nancy wasn’t as widely accepted as we may think. In the 50’s and 60’s, teachers and librarians actually opposed series books for kids. Thankfully they came around. Many of the books were given to nieces by childless aunts (this is a category that I myself fall into, and yes, I have purchased Nancy Drew books for my 5 year old niece). Reading Nancy Drew had an influence on readers’ professions as well. It led people to become librarians, police officers, and other male dominated professions. Go Nancy. It kind of started a new trend, and if you think about it, a lot of adventurous girls in fiction have absent mothers and great dads. Another thing I found interesting, was that the fans and the scholars had more of a contentious relationship. 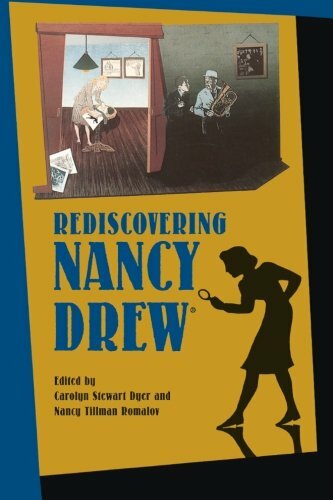 The scholars thought the fans idolized Nancy Drew without any analysis. The fans believed that the scholars didn’t know the history or appreciate all that the fans had done. Carolyn Dyer’s work on the book has brought her many great things. Her absolute favorites was the chance to lecture in Sweden. Lastly, there are two kinds of Nancy Drew readers: ones that remember everything they read and ones that just remember the warm fuzzy feeling they got from reading the books. I have to admit, I am the warm fuzzy kind. Which are you? Definitely the warm and fuzzy kind!